Cars, racing and a passel of my favourite movies! 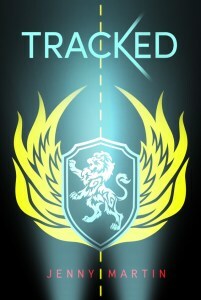 I talk with Jenny Martin about what makes YA sci-fi awesome and her book, Tracked. Don’t forget to check out how you can win a copy of Tracked at the bottom of the interview. BELINDA: What is YA science fiction to you? JENNY: First and foremost, it’s something near and dear to my heart. I spent a lot of my childhood with my nose science fiction novels. And while there were several wonderful speculative novels written for middle grade and teen readers, many of them were shelved in the adult section. Now, there’s a new generation of YA science fiction books, and it’s just wonderful to see. So many people, of all ages, are interested in asking “what if?” They daydream about the road ahead, where science, technology and humanity can take us. They’re interested in the intersection between the ingenuity of the mind and the restlessness of the heart. They’re fascinated by the prospect of faraway worlds and new frontiers, full of wondrous (and sometimes frightening) possibility. To me, that’s what YA science fiction is…an answer to that call. JENNY: Again, the answer probably lies in childhood. When it comes to science fiction, I don’t think my heart ever had a chance. I was always in our little public library. I always watching adventure movies like Star Wars and SF shows on TV. I was always daydreaming in class, about rocketing into space or traveling to another time or conquering a kingdom. SF was, and still is, my window, mirror, anchor and escape. BELINDA: Do you think there’s a difference between YA science fiction and science fiction marketed for adults? JENNY: Yes, and no. I think some SF has a distinctly old school or adult flavor. For many years, science fiction was largely dominated by white male authors, and/or authors explicitly interested in intensely focusing on hard science. But over the years, the genre has slowly evolved and now, there are so many subgenres within SF. Yes, the time honored conventions are still thoroughly explored, and many different authors pen these traditional SF sagas, but now, there are so many other types of stories. There’s something for everyone. There’s room for everyone to share a fresh point of view. I will say, that by and large, most YA SF seems to focus on heroes and heroines who are coming of age, on the raw cusp of adulthood. There is some crossover, with older narrators in YA and younger narrators in adult novels, but this pattern tends to hold. Overall, it’s a great era for SF. The field is wide open. Many readers are willing to champion both YA and adult books. BELINDA: Tracked is marketed as The Fast and the Furious (one of my favourites) with a futuristic twist. What inspired you to write a SF series about racing? JENNY: Believe it or not, the inspirations for the racing world of Tracked hit me all at once. Around that time, I came across the remake of Death Race 2000 (the one with Jason Statham). I was intrigued by the premise, and thrilled with the foot-to-the-floor racing scenes. Not long after, I watched a documentary called Hot Coffee, a fiercely critical look at politics, corporate greed, and its impact on the criminal justice system. From there, my Star Wars-obsessed brain put these two elements together. I imagined a planet (one that had been colonized and settled through land run races, like home state, Oklahoma) where corporations held all the political cards. And then I imagined how a spitfire street racer might fight to take them down. BELINDA: What’s next for you after the next book in the Tracked series, Marked, comes out in May? JENNY: Thanks for asking! It’s been so wonderfully cathartic to wrap up Phee’s story in Marked, and now I’m working on a top secret project, something completely new and unrelated to the Tracked world. It’s a star-crossed, epic, multi-POV saga that rides the line between science fiction and fantasy. I like to think of it as a tech-drenched, swashbuckling, feminist Game of Thrones. BELINDA: What are some of your favourite YA sci-fi novels? JENNY: This past year, I really enjoyed Zeroboxer by Fonda Lee (a fantastic, speculative book at zero gravity boxing), Lost Stars by Claudia Gray (a gripping story set in the Star Wars universe) and Illuminae by Amie Kaufman and Jay Kristoff (an action-packed saga told in a really cool, really original way). 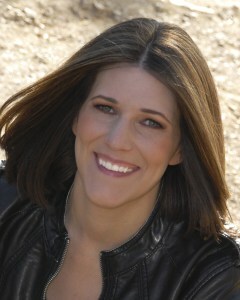 Jenny Martin is an author and librarian. Her first novel, Tracked, released on May 5th, 2015, by Dial, an imprint of Penguin Random-House. Tracked was named one of Paste Magazine’s and Teen Magazine’s ‘Best Books of 2015’, and its sequel, Marked, will be released May 17th, 2016. Jenny is also an experienced speaker, panelist and presenter who’s appeared Texas Teen Book Festival, Texas Library Association and San Diego Comic Con. She lives in the Dallas-Fort Worth area, with her husband and son, where she hoards books and writes fiction. And yes, she’s still on a quest for the perfect pancake. Find out more about Jenny and her books on her website or follow her on Twitter and Facebook. Win a copy of Tracked, along with six other awesome YA sci-fi books, in our giveaway running from 8 April 2016 to 10 April 2016. Feature image courtesy of Anne Worner (via Flickr). Used with a Creative Commons license.